Once a month, Mirasol Senior Community hosts a “High Tea” for the members of the Mirasol Event Center. Loveland is also known as the “Sweetheart Capital” it is only fitting to have “Miss Loveland Valentine 2016” in attendance. 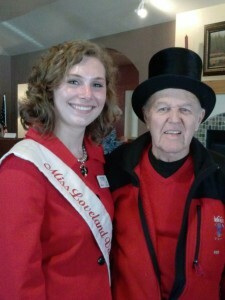 Pictured here at our February tea is our guest, Miss Loveland Valentine, Alice Mueller with Mirasol resident Bob Eckhardt.